A. Charlois discovered asteroid #307 Nike. F. Courty discovered asteroid #387 Aquitania. J. Helffrich discovered asteroid #698 Ernestina. M. Wolf discovered asteroid #889 Erynia. The US Army launched Explorer 2 toward Earth orbit. However, due to a fourth stage ignition failure in the Jupiter-C rocket, the satellite did not achieve orbit. NASA launched SOLRAD 9 (Explorer 37) to study the Sun. SOLRAD 9, launched 5 March 1968, was an NRL satellite, one of the SOLRAD series that began in 1960 to provide continuous coverage of solar radiation with a set of standard photometers. SOLRAD 9 was a spin-stabilized satellite oriented with its spin axis perpendicular to the sun-satellite line, so that the 14 solar X-ray and UV photometers pointing radially outward from its equatorial belt viewed the sun with each revolution. Data were simultaneously transmitted via FM/AM telemetry and recorded in a core memory that read out its contents on command. Individual scientists and institutions were invited to receive and use the data transmitted on the 136-MHz telemetry band on the standard IRIG channels 3 through 8. For the period July 1971 to June 1973, the core memory data of SOLRAD 10 were used rather than those from SOLRAD 9. The SOLRAD 10 core memory failed 11 June 1973, and SOLRAD 9 was heavily used until 25 February 1974, when the gas supply of the attitude control system was exhausted. Lacking attitude control, SOLRAD 9 was operationally useless and was turned off. For more details, see R. W. Kreplin and D. M. Horan, "The NRL SOLRAD 9 Satellite Solar Explorer B 1968-17A," NRL Report 6800, 1969. P. Wild discovered asteroids #2001 Einstein and #2034 Bernoulli. NASA launched the Landsat 3 Earth resources satellite from Vandenberg AFB, California on a Delta rocket. Detection equipment on satellites widely dispersed across the Solar system picked up a gamma ray burst originating from the remnants of supernova N49 in the Large Magellanic Cloud, leading to the discovery of soft gamma repeaters. 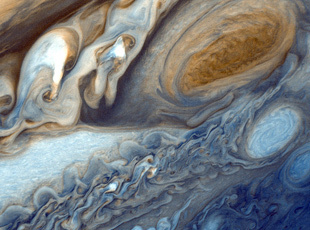 NASA's Voyager 1 made its closest approach to Jupiter, 349,000 kilometers (217,000 miles) from its center. H. Debehogne discovered asteroids #2461 and #3610. USSR Venera 14 landed on Venus about 950 km southwest of Venera 13 near the eastern flank of Phoebe Regio at 13 deg 15 min S by 310 E on a basaltic plain and returned pictures of the surface. Venera 14, launched on 4 November 1981, consisted of a bus (81-110A) and an attached descent craft (81-110D). It was identical to Venera 13, the two spacecraft were built to take advantage of the 1981 Venus launch opportunity and launched five days apart. After a four month cruise to Venus, the descent vehicle separated and plunged into the Venusian atmosphere on 5 March 1982. As it flew by Venus the bus acted as a data relay for the brief life of the descent vehicle, and then continued on into a heliocentric orbit. The bus was equipped with instrumentation including a gamma-ray spectrometer, retarding potential traps, UV grating monochromator, electron and proton spectrometers, gamma-ray burst detectors, solar wind plasma detectors, and two-frequency transmitters which made measurements before, during, and after the Venus flyby. The Venera 14 descent craft/lander was a hermetically sealed pressure vessel which contained most of the instrumentation and electronics, mounted on a ring-shaped landing platform and topped by an antenna. It carried instruments to take chemical and isotopic measurements, monitor the spectrum of scattered sunlight, and record electric discharges during its descent through the Venusian atmosphere. The spacecraft utilized a camera system, an X-ray fluorescence spectrometer, a screw drill and surface sampler, a dynamic penetrometer, and a seismometer to conduct investigations on the surface. After entering the atmosphere, a parachute was deployed. At an altitude of about 50 km the parachute was released and simple aerobraking was used the rest of the way to the surface. Venera 14 landed about 950 km southwest of Venera 13 near the eastern flank of Phoebe Regio at 13 deg 15 min S by 310 E on a basaltic plain. After landing an imaging panorama was started and a mechanical drilling arm reached to the surface and obtained a sample, which was deposited in a hermetically sealed chamber, maintained at 30 deg C and a pressure of about .05 atmospheres. The composition of the sample was determined by the X-ray fluorescence spectrometer, showing it to be similar to oceanic tholeiitic basalts. The lander survived 57 minutes (the planned design life was 32 minutes) in an environment with a temperature of 465 deg C and a pressure of 94 Earth atmospheres. K. Augustesen discovered asteroid #3033 Holbaek. NASA announced that the Clementine probe orbiting the Moon had found enough water to support a human colony.